AC Cool provides homeowners throughout Orange County with high-quality air conditioners and expert installation services at highly cost-effective prices. We are an award winning, licensed and insured HVAC contractor that has served the indoor comfort needs of tens of thousands of satisfied customers over the last 27 years. The longstanding success of our family-owned and -operated business and large number of referrals and loyal customers are the result of our unwavering commitment to providing exceptional service in everything we do. In order to give our customers superior service, we employ highly qualified staff, only sell heating and air conditioning equipment from Carrier, the industry's most-trusted brand, and consistently apply the leading practices for AC installation and replacement. Our AC installers are all factory trained by Carrier, NATE certified for heating and air conditioning installation, and highly experienced. Additionally, the owner, Paul, who has over 30 years of experience, is often out in the field ensuring that all work is on track and performed according to our high expectations, from the quality of the installation to final clean up. 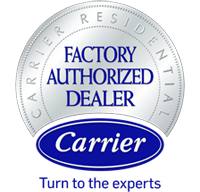 At AC Cool, we are proud to be a Carrier Factory Authorized Dealer. This means that we're able to offer our Orange County customers some of the most reliable and energy efficient air conditioners on the market today. Carrier air conditioners are available in three product lines--the Infinity, Performance, and Comfort series--in order to give each customer multiple options for the level of comfort, performance, and energy efficiency they seek. Regardless of which Carrier air conditioner you select, you can always feel confident in your purchase because Carrier stands behind its products with a 10-year parts limited warranty. Moreover, any Carrier air conditioning unit installed by a Carrier Factory Authorized Dealer will also be backed by a 100% satisfaction guarantee for one full year from the date of installation. 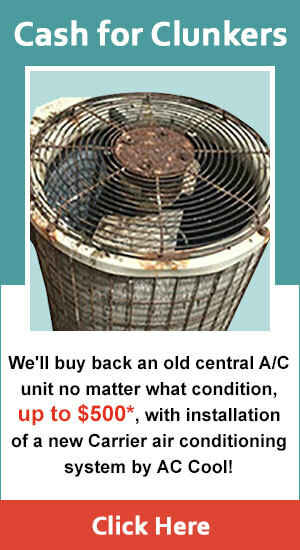 Deciding to replace one's air conditioning system is a major financial decision for most homeowners. Recognizing this, the experts at AC Cool go above and beyond in providing our Orange County customers with the guidance they need to select the best air conditioner for their needs and budget. Before providing any recommendations, one of our knowledgeable Comfort Advisors will want to set up an in-home consultation. This free, no-obligation consultation gives the Comfort Advisor the opportunity to assess the size of your home and each room, identify any hot or cold spots, inspect your ductwork and check the air loss, and review your current utility bill, and discuss any special circumstances or particular areas of concern. If needed, we can also make accommodations and adjustments to reduce noise, allow more individual room control, and/or improve air quality. Get a Personalized Indoor Air Conditioning Solution for Your Home from AC Cool Today! Call AC Cool today if you are interested in learning more about our air conditioning sales and installation/replacement services in Orange, Tustin, Santa Ana, Anaheim, Irvine, & nearby cities. Our technicians are also qualified to install and replace light commercial air conditioners (7.5 tons and smaller), furnaces, heat recovery ventilators, whole home fans, thermostats, and indoor air quality products, such as air purifiers, electronic filters and UV lights, as well as adjust or replace ductwork. We offer competitive pricing, stay current on available tax incentives and rebates, and can help connect you to flexible financing offers through the HERO program or Wells Fargo on approved credit.